Today's Images of Mars are two topographic maps of Mars from the Mars Orbiter Laser Altimeter (MOLA), which show the enormous variance in altitudes on The Red Planet. As you can see, much of the Northern hemisphere is much lower than the Southern hemisphere. The Northern hemisphere on Mars is 1-3km lower than the Southern hemisphere. The crust in the northern hemisphere averages 32 km thick, but the crust in the southern hemisphere averages 58 km thick. One involves a Pluto-sized object impacting with the northern hemisphere of Mars around four billion years ago. Scientists believe the impact created the North Polar Basin (also called the Borealis Basin), which is a depression that covers 40% of Mars, measuring 10,600 km and 8,500 km. If this was proven true it would be the largest impact crater ever discovered, beating out the Moon's South Pole-Aitken Basin. Another theory is less interesting; it involves tectonic processes. Scientists theorize that one half of Mars could have gone through an upwelling, when the other half went through a downwelling, as the result of mantle convection. The third theory suggests that the Borealis Basin is actually the result of multiple impacts. This theory has the least evidence to back it up and is statistically very unlikely to have occurred. Scientists have longed believed that the North Polar Basin (Borealis Basin) could have held an ocean in the distant Martian past. This theoretical ocean is called Oceanus Borealis. Recently new evidence has shown 100m thick sedimentary deposits from the putative ocean that differ significantly from volcanic rock. One question that has always puzzled scientists is, Where did the ocean go? 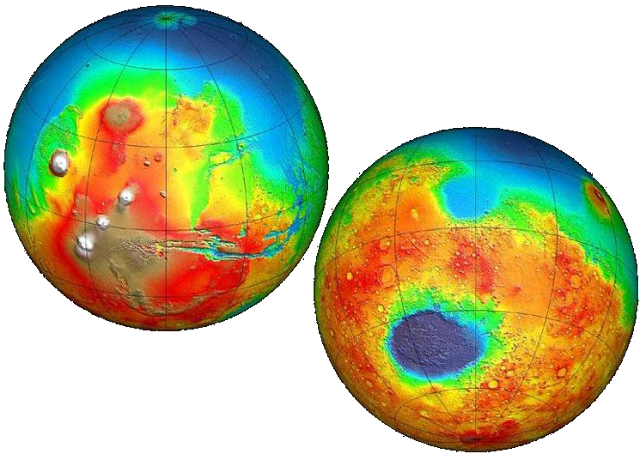 Recent radar mapping from the Mars Express Orbiter indicates that there is an enormous amount of water-ice beneath the Martian surface, and not just at the poles. It is possible that much of the water from Oceanus Borealis is still present, but frozen underground. It is believed that there was a liquid ocean as recently as 3 billions years ago, but that the water has since retreated underground.